Although Kelly Maxwell custom furniture maker is a Nashville staple for Music City visitors today. Littlebranch Farm began in Hamilton, Georgia in 2000 by Kelly and Cathy Maxwell. In a small shop on 16 acres at the foot of Ross Mountain, on the ‘Little Branch’ creek. Kelly Maxwell started with several unique garden benches and wood slab tables for a wedding reception for his oldest daughter; friends and family commented on Kelly’s talent and encouraged him to expand his craft. 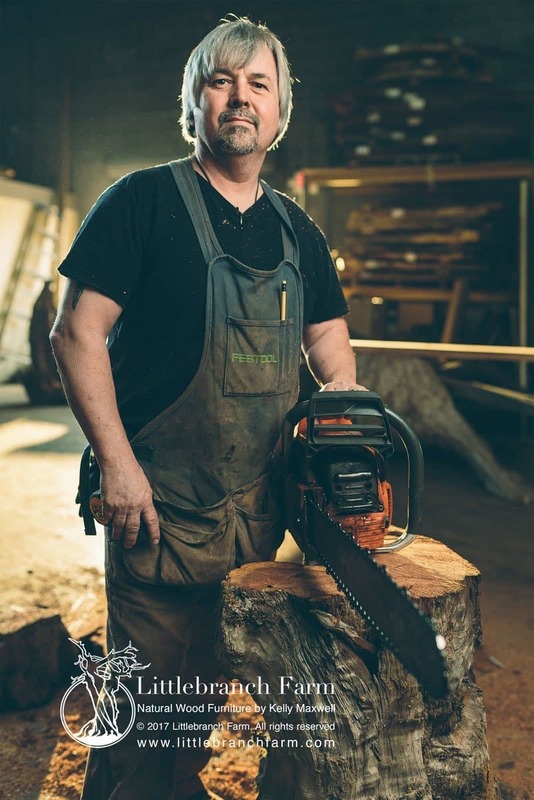 From that special wedding reception, and the encouragement from friends and family, Kelly began selling rustic log style natural wood furniture at craft shows in 2001 and by 2003 had expanded to log home shows and internet marketing. Kelly Maxwell rustic furniture maker in his Nashville, TN studio. In 2008, Cathy, a lifelong nurse, began a Ph.D. program. Eventually resulted in employment as nursing faculty in Nashville, necessitating the need to move our company. In June 2014, we took a major step by opening the Littlebranch showroom and studio at 901 2nd ave south in Nashville Tennessee. Kelly is self-taught, which speaks to his remarkable gift and artistic vision to produce unique and ‘one-of-a-kind’ pieces. Since its inception, Kelly Maxwell and Littlebranch Farm has been published in many local publications and four major log home magazines, including Log Home Design Ideas (July 2003), Log Home Living (March 2009), Country Best Log Homes (January 2010), Nashville Arts (May 2015), Log Home Living (August 2015), and Nashville Lifestyle (August 2016). Kelly was also a guest on The Highland Woodworker. He has also been featured on Tennessee crossroads as a custom furniture designer in Nashville, TN. Kelly is a featured artist at the Tennessee craft spring 2018 show at Centennial Park in Nashville. Known for the quality, originality, and captivating beauty of our work, Littlebranch Farm specializes in elegant custom rustic furniture using live edge wood slabs. Our greatest satisfaction is a happy customer. Although we do not produce a catalog you can find examples at our online gallery or store. Our style rustic furniture cannot be mass produced. This assures that each piece is original work, designed exclusively by Kelly Maxwell. We hope you’ll take the short drive to Nashville today, and discover what so many already have, a welcoming custom furniture Gallery, an artisan workshop, and the artist himself, Kelly Maxwell. From humble beginnings to the expansive workshop and gallery in the heart of Music City, Kelly has perfected his craft and become a sought-after custom furniture maker around the world. We would love to meet you and make your new or existing home more comfortable and inviting. What can we craft for you?